The iPurifier is naturally prepared for all PCM/DSD/DXD formats, without restriction. The signal passes through connector. Therefore, the connector must be as exceptional. Most USB connectors are of the moulded plastic variety. Plastic cannot shield the high frequencies present in the USB data link, so noise will radiate out. Durability is also compromised.The iPurifier is of the same fastidious design as the iFi Gemini USB cable matching the 90ohm impedance standard. 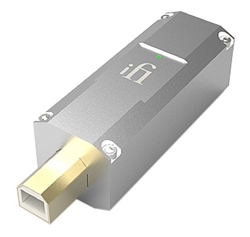 The FINAL USB connectors provides impeccable end-to-end RF shielding, being machined entirely from solid aluminium. Gold-plated connections make for years of steadfast service. It is literally, built and functions like no other.